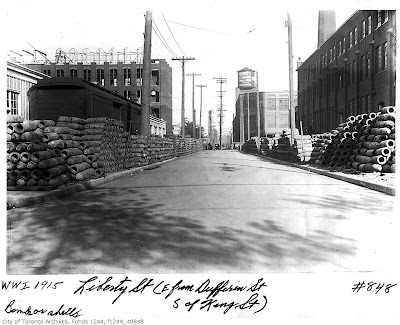 Below: ca.1915, during WWI - looking east along Liberty St. from Dufferin St. Bomb shell-casings are stacked on both sides of Liberty St. as far as the eye can see. Note at left that the railroad siding tracks came as close as Dufferin along the north side of Liberty St. Note the Toronto Carpet building under construction at far left. Until 1889, when Toronto annexed Parkdale, Dufferin St. was the western boundary of Toronto. click on photos to enlarge! above: same view, Apr.10, 2008. Behind where the water tower had once stood in the distance, the CN tower is now seen. The chimney at the right is seen in both shots. The building at the right had for decades been a General Electric light bulb factory The building at the left was the Russell Motor Car Company's Plant No.3, which built 'Graze' and 'Time Fuzes' for the WWI war effort. Construction on the 300' x 290' single-storey RMCC Plant 3 building was begun on Sept.15, 1916, and astoundingly, the factory was already producing fuses by December; by June of 1917, this factory, which had a capacity of 3,000 workers, was producing a million bomb fuses a month. The hand-written 1915 date on the earlier photo should then probably read 1917. In later years the Russell building housed the Barrymore Carpet factory. The former Russell plant as seen at the left in 2008, is now without a roof, its interior completely stripped out, and used as an outdoor brick-walled parking lot. Note also the streetcar tracks running along Dufferin St., which head south (to the right) to the Dufferin Loop by the CNE. 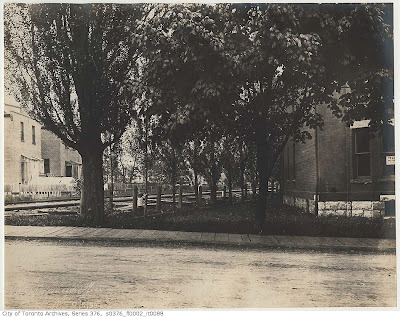 below: ca.1895 - Looking south from across King St. W. at the Mercer Reformatory for Women (1872 -1969) which took up the block bounded by Liberty St. on the south, King St. W. on the north, Fraser Ave. on the west, and Jefferson Ave. on the east: this is where Lamport Stadium was built later in 1974. I still remember seeing the Mercer before it was torn down, it was an imposing, gothic structure, several stories tall, with a tower at the centre. above photo from Canada Archives. above: same view, July 2012 - new roads and condominiums are being built on the north-side of King St. W., and in the centre-distance, where the Mercer had stood, is now the site of Lamport Stadium's soccer field. 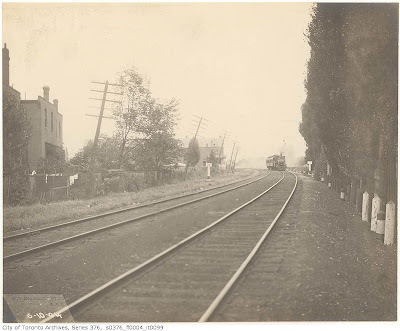 below: Oct.6, 1904 - standing on Dunn Ave., south of the Grand Trunk railway tracks, looking in a north-west direction towards Springhurst Ave. in the centre distance. The tracks crossed Dunn at a level crossing. There was a cabin at the left for the signal man. 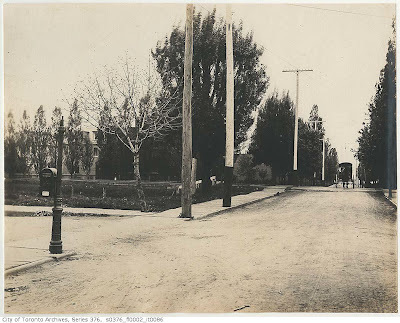 Behind the the man standing in the centre are visible some houses, which would be today's 70 and 68 Springhurst Ave.; at the far centre right is the side of house which is still on the north-west corner of Dunn and Springhurst. above: Apr.10, 2008, same view - looking north up Dunn Ave.; the tracks are now below, crossed by a bridge. The cabin had once been at the far left. The houses from previous photo above are still seen at the centre left. At the far right is the edge of the Dunn Milk store. below: Oct.6, 1904 - Looking east along the Grand Trunk tracks, standing south of the tracks on Dunn Ave. To the left is the rear (south-side) of houses which fronted onto Springhurst Ave. The Exhibition (now CNE) is in the far right distance. Along the right tree-line are the rear yards of homes which backed onto the south-side of the tracks. above: Apr.10, 2008 - same view, the tracks are now below grade; the same houses are still seen backing onto the tracks at the left, now with a slope behind their yard. The Dufferin Ave. bridge, which crosses the tracks, and now also the Gardiner Expressway, is seen at the far distance. All the houses at the right (south) of the tracks were demolished in the mid-fifties for the Gardiner. below: Jun.4, 1899 - looking south down Dunn Ave., standing on the west side of Dunn, just north of Springhurst Ave. The tracks are seen in the distance, where a horse-drawn carriage is crossing them. The row of trees (seen previously in the second-last above photo) are seen at the far left distance. Beyond the tracks, south all the way to Lake Ontario's shore, were more houses along south Parkdale's leafy suburban streets. The north-east corner of Springhurst Ave. and Dunn ave. is seen at the bottom left; the south-east corner of Springhurst and Dunn is seen at the centre-left. The lot (on the south-east corner of Sringhurst and Dunn) is seen vacant, from Springhurst to the tracks. A birch tree stood on the corner. above: Apr.10, 2008, same view - the Dunn Milk store building now sits on the vacant lot where the birch had once been. A bridge now carries traffic over the tracks; Lake Ontario glistens in the distance. All the houses in Parkdale south of the tracks are now gone. below: Aug.4, 1910 - Looking east along the Grand Trunk railroad tracks, from the west side of Dunn Ave., where the tracks crossed Dunn Ave. at grade. A building with a 3rd floor mansard roof is seen at the left; this building (which later housed Mac's Milk in the 60's and 70's and Dunn Milk recently) is at the south-east corner of Springhurst and Dunn. Note the large third story side gable profile of the house behind, in the left distance; this same house gable is still seen in the 2008 photo further below. Also note the tree-line at the right (south) side of the tracks, as seen earlier above. I remember that there was a line of tall thin trees still along the tracks here, I would say probably still into the 1970's (?) but cannot recall whether they were still on the south-side of the tracks, or they may have been replanted on the along the north side of the tracks by that time. This tree-line style of landscaping, I assume, was used to hide the rail corridor and to possibly attenuate some of the rail noise; I remember that the same kind of trees also ran along parts of the railroad line in the Sunnyside area. above: same location, Apr.10, 2008 - the same building with the side gable, which was seen in the previous 1910 photo, is still seen in the distance, behind the Dunn Milk store. Now, the photo is taken from the Dunn Ave. overpass, which crosses the railway tracks below. The lot behind the Dunn Milk building now slopes down to the tracks. Note the rear shed roof still in the same place. 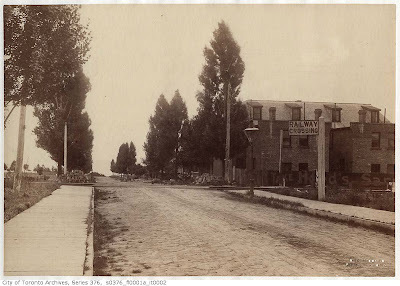 "Springhurst Ave. was originally called Huxley by Eliza Anne Gwynne and Patrick Close to honour the natural scientist, Thomas Huxley (1825-95), it ran only two blocks from Dufferin to Spencer. In 1889, when Huxley was extended west to join up with William, the first street west of Jameson, both names were changed to ‘Springhurst’ after the former Spragge estate, named in recognition of the area’s numerous springs." Also of note is that the houses on the north-west corner of Dunn and Springhurst have not yet been built, and neither have the houses on the north-east corner. Helping date this photo is the presence (seen in the far right distance) of the Parkdale Dunn Ave. Methodist church's great tower. This church had been built 1889-90 . . .
. . . and was located on the south-east corner of Dunn Ave. and King St. W.
In the centre of the below photo is seen a large Victorian house (gable and chimneys behind the trees) which faced the west side of Dunn Ave., and its coach house at the back. I remember this house still standing in the late 1970's, it was located just a little ways north of Springhurst Ave., and was set back farther than the other houses on the street (which obviously, were built later. In the next below photo, the 'newer' houses are still seen.) 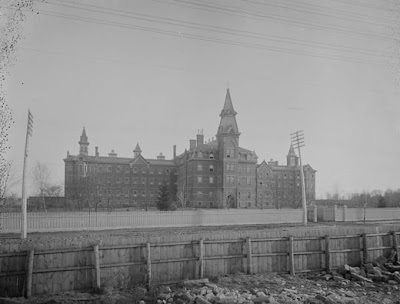 The Queen Elizabeth Hospital (formerly Home for Incurables) site was bounded by Dunn Ave. on the east, and Close Ave. on the west, and just south of King St. W. on the north, to almost Springhurst Ave. in the south. This large house stood just at the south side of the hospital grounds; over the years, the hospital has purchased many homes along Close Ave., Dunn Ave., and Springhurst Ave., and knocked many of them down; this Victorian was one of them - there is a parking lot now where the house had been. That's the house seen below with the chimney between the trees in the centre. 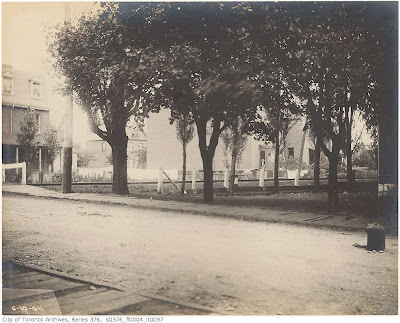 (Joseph Spragge's bucolic farm-estate "Springhurst" had been located south of Lot St. (now known as Queen St.) near to what is today the south-west corner of Queen St. W. and Jameson Ave.
Joseph Spragge was an educator and Master of the York Central School under Bishop Strachan. Spragge (1775-1848) and Col. Walter O'Hara (1789-1874) were the two earliest settlers in the still-forested 'James Brock Lands' located west of the Fort York Military Reserve, lands which were eventually subdivided and developed into the future village of Parkdale. Spragge was already living in this hinterland (the 'future-Parkdale'!) in 1824. Col. Walter O'Hara's estate, "West Lodge", was located north of Lot St., near what is today the north-east corner of Lansdowne Ave. and Queen St. W. The City of Toronto bought the original West Lodge house in 1956, and subsequently demolished it to build the May Robinson apt. complex. Spragge's son John Godfrey Spragge became the Chief Justice of Ontario. above: same view, Apr.10, 2008 - houses on the north-west and the north-east corner of Springhurst and Dunn are now seen, the Dunn Milk is at right on the south-east corner. A bit of the ("new", mid-1970's-built) Queen Elizabeth hospital is seen at the far left distance. 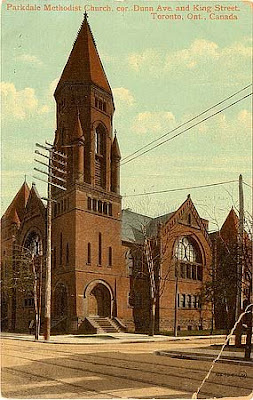 The Parkdale Methodist church was torn down in the mid 70's (possibly winter 1974-75) - a beautiful building it was, I remember it well, having been in it, and also remember it being demolished. below: Oct.6, 1904 - looking south-east along Dunn Ave., standing on Springhurst Ave. north of the Grand Trunk railway tracks. The corner of the 'Dunn Milk' building is seen at the far left. A large house is seen facing Dunn Ave., just south of the tracks, with a line of trees beside it and the tracks. above: same view, Apr.10, 2008 - The Dunn Milk building gives perspective to the previous shot - the tracks which were at grade behind the building are now dropped below the bridge, and all the houses that once were on the south side of the tracks are now gone. 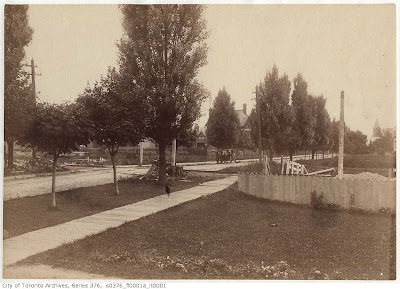 below: Jun.4, 1899 - looking north-east along Dunn ave., standing on Dunn Ave. south of the Grand Trunk railroad tracks; the corner seen at the left is the north-east corner of Dunn Ave. and the now-vanished Empress Cres. Looking to the centre-right can be seen a row of three story semi-detached Victorian houses that face onto the north side of Springhurst Ave. These houses are visible from this view because across the street from them, on the south-east corner of Dunn and Springhurst, the lot was still vacant - the Dunn Milk building had not yet been built. above: same view, Apr.10, 2008, looking north-east up Dunn Ave. from south of the tracks. The same Victorian houses facing the north-side of Springhurst Ave. are in the distance, the Dunn Milk building is in front of them, and the Dunn Ave. bridge with the railway below is in the foreground. Where Empress Cres. 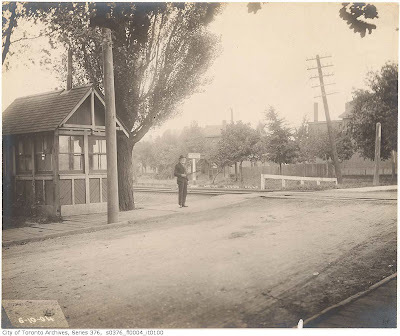 was, to the left, is a now grassed median between the railroad embankment and westbound-Lakeshore Blvd. above: Apr.10, 2008 - same view, looking north-west up Dunn Ave. from south of the tracks. Dunn Milk is at the far right; at the far left is the 22 Close. Ave apt. tower, built in the early 70's on the site of a row of block-busted houses along the west-side of Close Ave., stretching from Springhurst north to the south fence of Queen Victoria School. below: ca. 189? 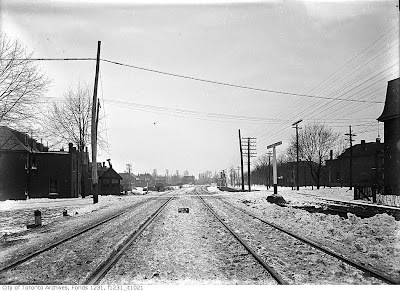 - looking south down Dunn Ave.towards the Grand Trunk railway tracks, from Springhurst Ave. The houses at the right would have been facing Empress Cres. and backing onto the tracks. The shore of Lake Ontario is just down the street at the foot of Dunn Ave.
below: Oct.6, 1904 - looking north-east along Dunn Ave., standing on the west side of Dunn ave. just south of the tracks - the rear of the Dunn Milk building is seen at the far left, the corner of the house with the tree-line beside it is seen at the far right. At the centre right is the side-view of a house which faced onto the south-side of Springhurst Ave.; in the centre-left distance (behind the tree) is seen a large gabled house which faced the north side of Springhurst Ave.
above: same view, Apr.10, 2008 - the rear of Dunn milk is at the left; at the right is the side-view of the same house facing the south-side of Springhurst; in the centre can be seen the same gabled house, painted white, facing the north-side of Springhurst. below: Jun.4, 1899 - looking still at the east side of Dunn ave., standing just south of the tracks; the Dunn Milk building would be just out of frame to the left. Seen at the left is the rear of the houses which faced onto the south-side of Springhurst Ave. In the centre are the tracks; at the right is the tree-line beside the tracks, next to the house which was on the east side of Dunn ave., just south of the tracks, and just north of Empress Cres. The house has a "To Let'" sign on its window. 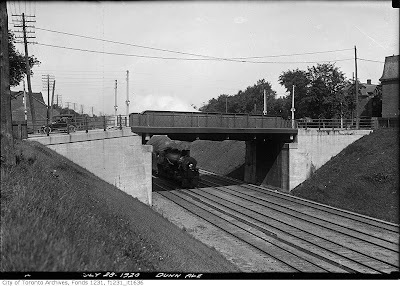 below: July 28, 1920 - looking west along the Grand Trunk railway tracks; the Dunn Ave. bridge is in the foreground with a steam locomotive below. The Dunn Milk building is at the far right. The rear of houses which once faced Empress Cres. line the left side of photo. 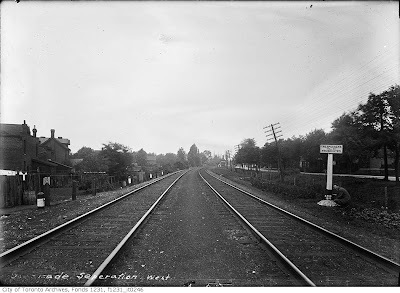 below: Aug.4, 1910 - Looking west along the Grand Trunk railway from Dunn Ave.; Springhurst Ave. is seen at the right. The houses at the left faced Empress Cres. The South Parkdale railroad station is in the distance. 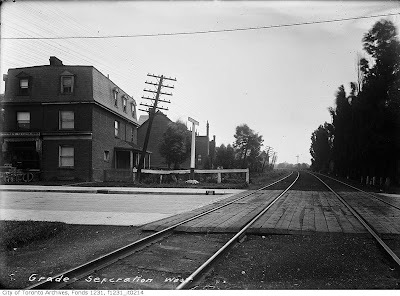 Note, the South Parkdale station was located on the north side of the tracks, south of Springhurst, between Close Ave. and Jameson Ave. When the railway grade separation construction began, the train station had to be knocked down as it was in the way of the excavation. A temporary station was built a bit further west: it was located west of Jameson Ave., on the south side of Springhurst, just where the street curves north on its way up to King. Once the new grade was done, another station was built at Dufferin St., stretching west from immediately below the Dufferin bridge. above: same view, Apr.10, 2008, seen from the Dunn Ave.bridge, looking westward along the CN tracks, the Jameson Ave. bridge is in the background; Springhurst Ave. is along the right. above: same view in winter, Feb.9, 1911 - looking west along the Grand Trunk railway from the east side of Dunn Ave. Dunn is actually crossing in the foreground; at the far right is the edge of the Dunn Milk building, with the mansard roof. The outline of houses facing the north side of Springhurst, west of Dunn, are seen at the centre-right. The rear of houses facing the north-side of Empress Cres. are at the far left. The signalman's shed (seen near the beginning of this post) is visible at right, on the west side of Dunn Ave., just south of the tracks. 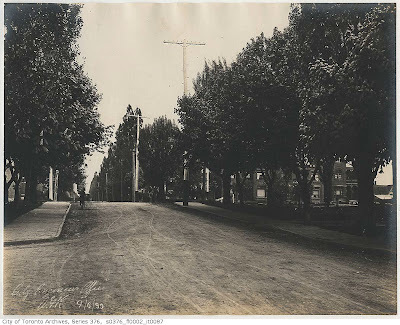 below: July 11, 1925 - looking in a north-westerly direction up Dufferin St., towards Springhurst Ave. in the left centre-distance, where the row of gabled houses is. 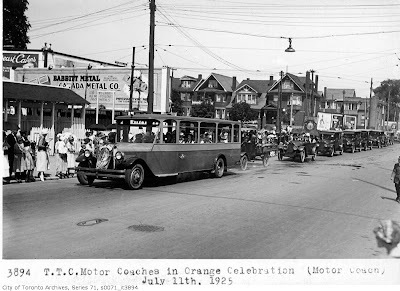 A TTC motor coach, part of an "Orange Celebration", is heading southbound towards the Exhibition. The TTC Dufferin loop is at the far left. Note two kids are watching the parade, sitting on top of the billboards at the upper left. above: same view, Apr.10, 2008 - the Dufferin Loop is still at the far left. On the lot where the advertising billboards were seen previously (where the kids once sat; on the south-west corner of Springhurst Ave. and Dufferin St.) there is now an apartment building. 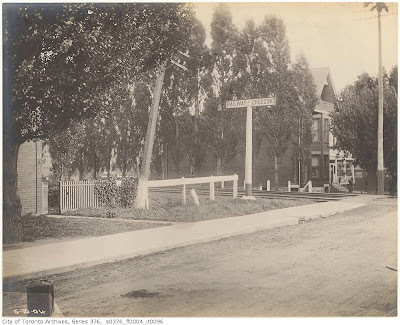 The same row of houses are still seen on the north-west corner of Dufferin and Springhurst, but with the addition of another house right on the corner (seen with the red roof) which was since built onto a vacant lot on the corner; in the 1925 photo, billboards seen on that vacant corner. Older photos in this essay are from the Toronto City Archive; the recent photos are by R. Bobak. Thanks for visiting Right In Niagara. Excellent research on your site. My Grandparents lived on Dunn south of the tracks and their house was demolished to make way for the Gardiner in the 1950's.